The Mexican Mayan Riviera (Cancun South) is, in short, a public relations dream of a name. First and foremost, let's get the geography lesson out of the way. Quintana Roo is a state in Southeastern Mexico on the eastern part of the Yucatan Peninsula with a population of 1.3 million. The Caribbean Sea is to the east and the nation of Belize is to the south. 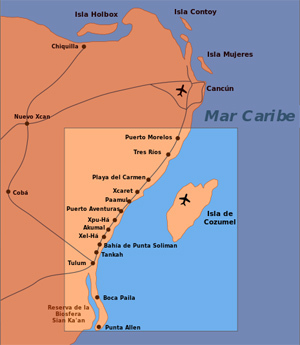 If the name Quintana Roo is not familiar, look at some of the cities contained within the state; Cancun (800,000), Playa del Carmen and the island of Cozumel enhanced further by the Mayan Ruins at Tulum, Coba, Oxtankah and Kohunlich among others. In the late 1960's the Mexican government built the city of Cancun from a small fishing village to attract more American tourists to the area. In 2012 there were over 1.6 million visitors from the US. The hotel zone spans approximately 16 miles with more than 34,000 rooms in Cancun and 40,000 in the Riviera Maya (the largest number in Mexico). There are condos and resorts facing the Caribbean, plus over 2,000 stores. On the island side is Laguna Nichupte with marinas, restaurants, shopping malls, two golf courses (there are 13 in the Cancun/Riviera Maya area) and a few islands. There is only one road so you can't get lost. Forty minutes southbound and you are at the airport, which is the second busiest in Mexico (after Mexico City). The "Party Zone" is halfway between the Hotel Zone and downtown and it is filled with nightclubs and discos.